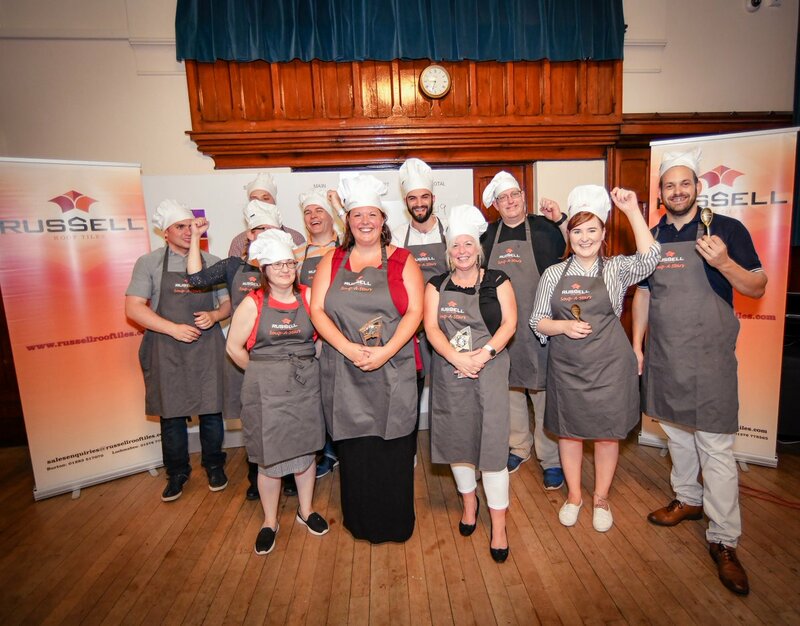 Two Russell Roof Tiles employees proved that they were the ultimate Soup-a-Stars at a special Master Chef-style event recently, which saw £1,300 raised for charity. Hosted by the leading roof tile manufacturer, the fundraising event, named Soup-a-Stars, saw six couples from Russell Roof Tiles battle it out in front of friends, colleagues and food lovers, in a bid to be crowned cooking champion and raise money for local charities Staffordshire, Shropshire and Cheshire Blood Bikes, Dumfries and Galloway Blood Bikes and Nith Inshore Rescue. More than 40 people attended the event in Burton to try the couple’s mouth-watering dishes including Feta and Pesto Tartlet and Salmon-en-Croute. Guests judged the couples on taste, appearance and creativity, eventually awarding the pink team – made up of Victoria Gibbs and Theresa Ensor – the most points for their delicious three course menu. Ticket sales and a raffle all contributed towards Russell Roof Tiles – which has two sites in Burton on Trent and a further site in Lochmaben – raising a fantastic £1,300, which will go towards supporting the Blood Bikes charities. Both are volunteer-led, providing lifesaving medical supplies to NHS foundations, by transporting vital blood products, bone marrow, breast milk for premature babies and other life-critical supplies to local hospitals via motorbike, where every minute counts in helping seriously ill and injured patients. Araminta Chesters, Financial Director at Russell Roof Tiles said: “At Russell Roof Tiles, we enjoy holding unique yet exciting events, where our staff, customers and friends can have fun while raising money for brilliant, local causes. Last year’s fundraising events topped £32,500, as staff at Russell Roof Tiles, danced, ran, hiked, quizzed and even slimmed their way through the year raising much needed funds and the company hope to top this total in 2018. For more information on Russell Roof Tiles, please visit www.russellrooftiles.com.